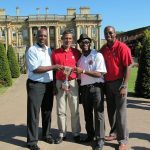 The rescheduled event for the fix-up trophy was held at Ombersley Golf Club. The course was in very good condition in spite of the heavy rain that had fallen the night before. The greens were slightly on the damp side but they were receptive and running well. The sun was out but there was a prospect of thunder and lightning possibly hitting us before the end of play. There was good turnout considering it was only a short time before the previous event but all those in attendance were keen, competitive and ready to go. 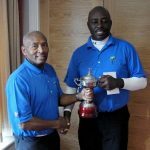 It was in 2010 when the CGS last visited Ombersley Golf Club and on that day the winning score was 39 points by Roan McLeod who was playing off 9 at the time. This time around playing off 7 Roan wasn’t able to get the win scoring only 34 points, It was a score that would put him mid table. 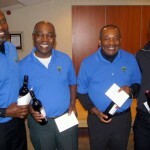 The scoring on the day was quiet high Ombersley is not a tough course especially for seasoned golfers like CGS members. The flat course layout didn’t pose too many problems for most with average score s being in the mid to high thirties. 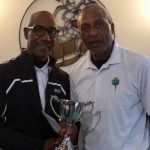 Newly joined member Carlton Donald who only joined this season having played as a guest in the previous had already collected a 3rd place finish so far this season and was very keen to push to the next level. As the day went on the weather held up as the expected rain abated but the thunder that could be heard in the distance would hit Birmingham causing much flooding and the unfortunate loss of a life. 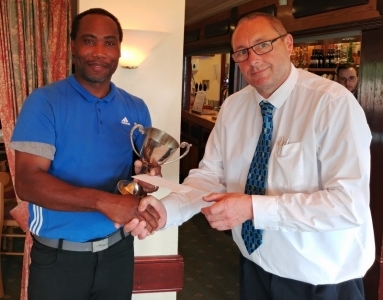 Out on the course the usual suspect would capture the longest drive on the 18th hole, Ian Higgins seems to be supplementing his income with the prize for longest drive with yet another win. 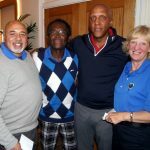 On the 5th hole the nearest the pin was settled with Ansel Pottinger taking the prize for that one shot challenge and on the 10th Jacko Powell would take the prize for nearest in two. 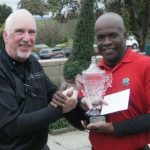 The 3rd place prize for the most stableford points went to Ian Higgins with 38 points just pipping CGS captain Jacko Powell on count back, yet another prize for Ian. In 3rd was Chris Powell who posted one better with 39 points, I’m sure Chris would say a missed putt here or there cost him the first place. 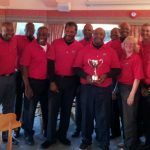 On the day the competition scratch score was set at 38 points which just showed the standard on the day with up to 7th position score at least 37 points. 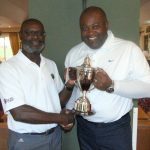 All being said the winning score was 41 points which was set by the man of the moment and so far looking like the most improved golfer of the season and moving up a few steps on the podium from his 3rd place at Founders day is Carlton Donald. 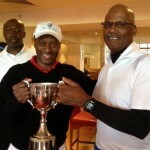 The reports from his fellow competitors was that Carlton was tearing up the course and would be very hard to beat. The final result showed their assumptions to be true. 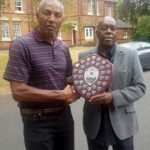 Well done to Carlton becoming a CGS member as already paid dividends as you are now eligible for the Champions of Champions event this season and for seasons top come.